It seems that the Coyote powered GT's are not significant enough to warrant their own heading on this board. Yet, they out perform many of the vehicles that have their own sections. 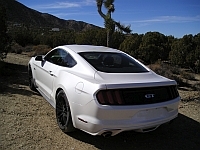 For instance, the old Mustang Cobras prior to the Terminator and all stock Lightnings and Raptors, etc., would not win at the 1/4 mile or handle as well, as the Coyote based GT's. Personally, although I loved my '03 Cobra, when I could not longer push the clutch in I was able to accept a new auto trans GT since it finally got some engine performance. All the prior GT's lacked punch stock. I was car #153 at Famoso and the dyno was the final tune from RET, SAE corrected. These numbers confirm what I stated above about the verified performance and power of other Ford performance vehicles. And, the video did not lie, either. Here is the time slip for PMachy's, David's, best run that day with his manual trans Coyote stock down to the paper air filter and running the stock Brembo package with the 19" tires. His dead stock car, with paper plates, made 9 less RWHP on the RET dyno than mine. And his 12.657 ET on street tires at Famoso was extremely impressive.... Car #178. Of course, David is a true drag racing talent, so the ET no doubt would not be even approached by most other drivers. Still, over 112 trap speed, dead stock, is killer performance. Here is a video of my former Coyote, leading a Terminator that is having trouble hooking up in the wet. THe true sound of the coyote can be heard in this top video from my channel. Quite a contrast to my 5.0 at the streets. Mine was quiet and smooth and boring.